There are various causes of gastritis: Bacteria, long-term medication, bile reflux, autoimmune disorders, eating at irregular hours, stress, or high consumption of alcohol. To remedy gastritis, there must be a lifestyle and diet modification. Eat in small amounts frequently rather than three big meals. Chew your food thoroughly to ensure proper digestion. DO NOT drink water with a meal to prevent dilution of digestive enzymes. Avoid foods that irritate: Processed/refined foods, deep-fried foods, soda drinks, alcohol, beans, citrus fruits, spicy foods. Eat a bowl of oats daily for breakfast. Include plenty fruits and vegetables into your diet. This juice combo has been reported to provide some relief for individuals suffering from gastritis. Drink once or twice a day at least half an hour before a meal. Drink daily till gastritis attack occurring less. Important to improve eating habits as mentioned above. Drink LOTS of water in between meals. Read about the health benefits of potato. plz tell me what is the best time used this juice?????? 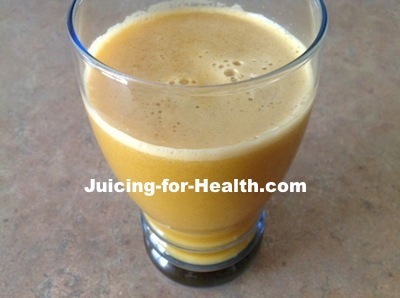 Hi Sara, best time to drink this juice will be on an empty stomach in the morning, so that it can help with the healing. Eat a solid meal half an hour later. I have gastritis, i want to be healed, should i be doing juice fast? Hi Leah, the short answer is yes and no. I suggest you do a juice feast instead, where you feast on juices, eat fruits and vegetables. The idea is not to be hungry in order not to bring on the gastric attacks. Avoid acidic fruits if they irritate your stomach. During this time, also take a course of high-quality probiotics to help improve your digestive system’s health. Read more here: https://juicing-for-health.com/juice-fasting.html.